Click on the 'play' symbol in the second image to see all my photographs of this church as a slide show, then click on any image in the slideshow to see it large in a new page. Alternatively, if you don't have flash enabled, you can go straight to the set for this church on flickr. I at last broke free of Colchester's urban sprawl, because between me and the next church was Wivenhoe Park, campus home of the University of Essex, and beyond it Wivenhoe is a delightful little waterside town, with the one crimp that its church is St Mary. Locked, no keyholder. 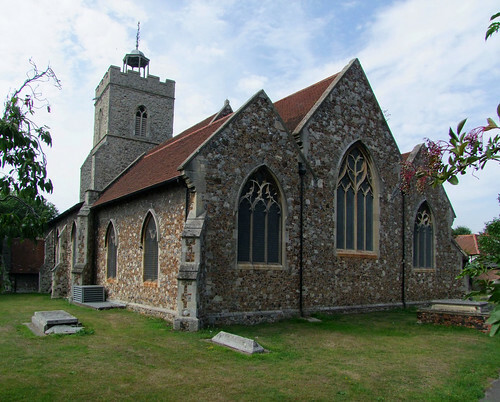 This is a large, ugly church, completely rebuilt in the 1880s by the barbarian Edward Hakewill who inflicted punishment without mercy on so many East Anglian village churches. The sign said 'the church may be open weekends in summer' - well, excuse me for a moment while I let off rockets in celebration. But the quayside is utterly lovely, and I could not resist the temptation to sit outside the pub, my feet on the water's edge, with a pint. I looked up towards Rowhedge, but nobody was waving.